Françoise and Stéphane Dief were driven by their passion for wine to produce wines they love to drink and that others would appreciate as well. They are part of the Bordeaux “garagistes” winemaking movement where they literally turned their garage into a makeshift wine cellar and made their first wine 1998. Just 600 bottles. The vines are on average 40 years old and their vineyards are made up of 45% Cabernet-Sauvignon, 45% Merlot, including one parcel of land dating from the 1850s, which survived the great phylloxera epidemic, 6% Old Cabernet Franc and 4% Petit Verdot from massale selection (non cloned). The Clos Manou vineyard is made up in equal parts of three distinctive but complementary styles of soil, gravel on clay, sandy gravel and clay on limestone. 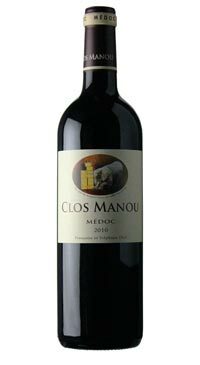 Clos Manou is aged for 17 months in new barrels made exclusively from French oak and medium toasted. Ageing on the lees and lees stirring for ten weeks adds a creamy texture to this powerful red.